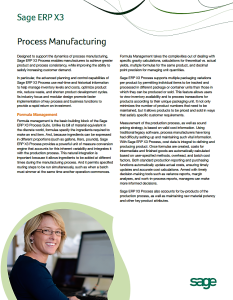 Designed to support the dynamics of process manufacturing, Sage Enterpirse Management (formerly known as Sage X3) Process enables manufacturers to achieve greater product and process consistency, while improving the ability to satisfy increasing customer demand. In particular, the advanced planning and control capabilities of Sage Enterpirse Management (formerly known as Sage X3) Process use real-time and historical information to help manage inventory levels and costs, optimize product mix, reduce waste, and shorten product development cycles. Its industry focus and modular design promote faster implementation of key process and business functions to provide a rapid return on investment.